Daylight savings is the bane of my existence sometimes. I really, really want to photograph what I make, talk a walk round the lake, feed the ducks, and generally enjoy the sunshine but I can't because as I drive home everyday the sun is rapidly sinking behind the horizon and often by the time I get out of the car it's completely gone. As I'm by no means an early riser the entire point of daylight savings is lost on me. When I leave for work, daylight savings for not, it's light anyway. I would much rather it were light(ish) when I returned home. Still, no point whining as someone out there probably benefits from it and even if I don't at least I have a window at work. Better windows then I have at home, in fact. I wish I could take my photos there but that would be really, really weird. So daylight savings makes it does make it hard to get things that require light done. And as I don't own any lighting equipment and can hardly justify buying any it means so many things I make neve g et photographed. Anyway no point whining because, as you can probably see, there's brownies to be had. 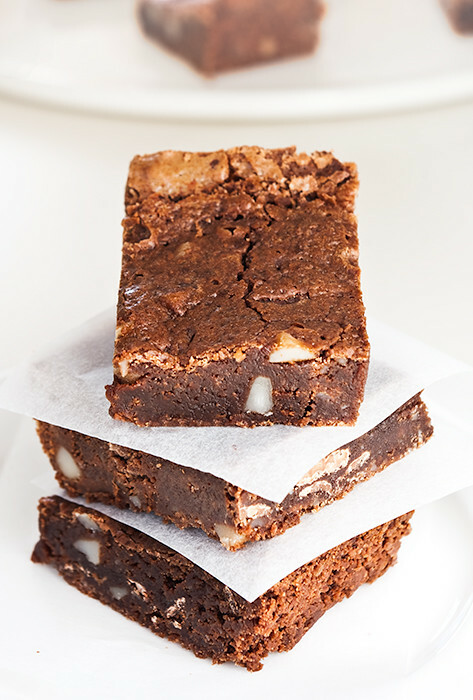 Tasty, tasty, fudgy chocolate brownies. Yum. It might be cold and dark but it's totally okay. Bring 5cm (2") of water to the boil in a saucepan. Place the butter, bitter-sweet chocolate, and unsweetened chocolate in a heatproof bowl and set it over the water. Turn off the heat and stir the chocolate until it is melted and the mixture is smooth. Remove the chocolate mixture from the heat and whisk in the sugar. Whisk in the eggs, one at a time, stirring well to incorporate. Whisk in the salt and flour. Stir until the batter turns from dull and broken to smooth and shiny. Whisk in the chocolate chips and nuts. 35 to 40 minutes or until a skewer inserted into the middle comes out with a few moist crumbs clinging to it. Transfer to a rack and cool completely. When the brownie is cool, run a thin knife around the edges of the pan. Grasp the edges of the baking paper and gently pull upward. Set the brownies on a cutting board and slice into 16 even pieces, then serve or store in an air tight container for up to 3 days. yum! talk about comfort food. these look so soft and chocolatey. also, i understand your daylight savings/light dilemma. now that it's getting cold (and darker earlier) i have to be creative with how i photograph food. These brownies looks really reallu good. I love when these little treats are thant fudgy! I no longer can see your beautiful photos at work (for some strange reason Flickr doesn't work there anymore) and I am sure missing out on some great recipes. Your brownies are decadent! So beautiful. 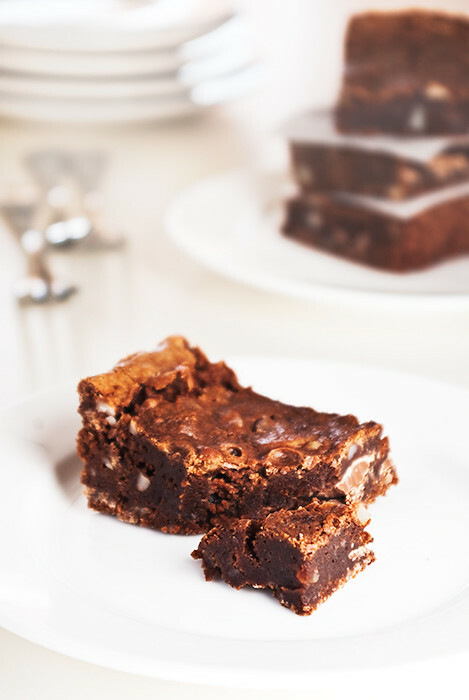 yum, I'm always on the lookout for a new brownie recipe and this definitely fits the bill - rich and fudgy!